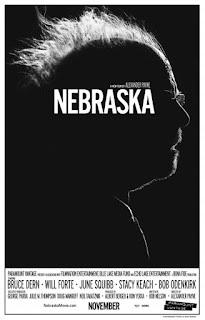 Nebraska is a wonderful picture about old age—literally in black and white. Black and white is apt, not only because of its photographic clarity, but also because it sometimes shows the grayness and bleakness that is frequently a part of old age. As father and son go driving through the bare snowy landscape of Montana, South Dakota, and Nebraska, it metaphorically captures what Woody Grant (Bruce Dern) is experiencing in the senescence of his life, and something he is fighting against as mightily as he can. Woody has a dream that he just cannot let go of; he is convinced when he receives a notice in the mail that he has “won” a million dollars, he fails to read the fine print that says he will actually be entered into a contest for the prize if he buys certain magazines. No amount of reasoning or reading the paper aloud on the part of his family will convince him, and after he takes off walking toward Lincoln, his son David (Will Forte) compassionately offers to drive him on the assumption that when Woody is told “officially” he has not won, his father will be convinced. Besides, his son sees it as an opportunity to have some quality time with his dad, who was not an attentive father to his sons. The road trip has many adventures, some of which are very trying, and others even more trying. They end up stopping in the family’s old hometown, where they visit relatives, and Woody’s wife Kate (June Squibb) and other son Ross (Bob Odenkirk) join them. Then they get to find out all the debts they suddenly “owe”, once Woody spills the beans that he is now a millionaire. When they finally make it to Lincoln to the prize offices, Woody is indeed given the truth, but the adventures are still not over. The ending is classic Alexander Payne: bittersweet but satisfying. Payne is a master of characterizations that seem familiar to all of us; we are convinced we have met them before in our own lives. Moreover, he has a sixth sense about casting where the actors fit into the characters hand-in-glove. Bruce Dern—an unlikely choice at first glance—perfectly captures Woody’s agedness, from his “Huh? !” to every question posed to his wild-eyed look of surprise when someone stops him from walking to Lincoln. This is especially noteworthy because the actor himself is still so sharp minded. On a Charlie Rose interview, his memory was keen, and his wit very quick. The other main characters are also extremely well cast. Will Forte’s performance is probably the best of his career as an actor; he is a perfect foil for Bruce Dern’s character, who can be trying. Forte as one of his sons conveys patience, compassion and love with complete genuineness. June Squibb is a standout for her cheekiness in playing Dern’s wife, and her stating plainly what is going on in situations where others are hemming and hawing or playing a con game. Bob Odenkirk as Dern’s other son, and Stacy Keach, one of his old partners, are both great supports. Nebraska is sure to capture some Oscar nominations, so you won’t want to miss it.